Chicago Shakespeare Theater ticket holders are guaranteed discounted indoor parking at the Navy Pier Garages two hours prior to each performance. 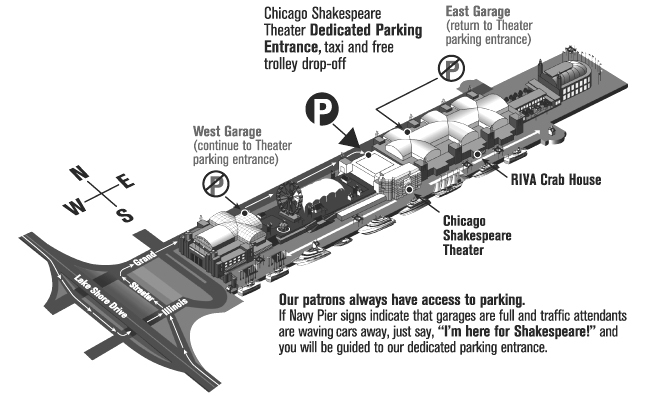 When parking says "full," simply tell Navy Pier Security that you're "here for Shakespeare," and continue to the Theater's dedicated parking entrance. Take a ticket from the automated machine as you enter the parking garage through the Theater's dedicated parking entrance. You must have your parking ticket validated in the Theater Lobby to receive your discount. Before departing for the Theater, view the local traffic resources available online. East on I-90/94 (Kennedy Expressway) to Ohio Street. East on Ohio. Right on Fairbanks/Columbus Drive. Left on Illinois Street, driving east to Navy Pier. Or, south on Lake Shore Drive to Grand Avenue/ Illinois Street exit. Left on Illinois (2nd light), driving east to Navy Pier. West on I-90/94 (Dan Ryan to Kennedy Expressway) to Ohio Street. East on Ohio. Right on Fairbanks/ Columbus Drive. Left on Illinois Street, driving east to Navy Pier. Or, north on Lake Shore Drive to Grand Avenue/Illinois Street exit. Right on Illinois (1st light) to Navy Pier. East on I-290 (Eisenhower Expressway). Continue east (expressway ends) on Congress Parkway to Columbus Drive. Left on Columbus to Illinois Street. Right on Illinois, driving east to Navy Pier. If you are arriving via taxi, direct your driver down the north side of Navy Pier and request a drop-off at the Theater’s dedicated parking entrance at the RIVA turnaround (Entrance 1, about halfway down the Pier). Enter through the doors and turn right to reach the Theater. Taxis pick-ups are available at the Theater’s dedicated parking entrance at the RIVA turnaround (Entrance 1). To reach the RIVA turnaround, turn left at the foot of the Theater stairs and proceed down the hall past Tiny Tavern. If you are arriving rideshare service, direct your driver down the north side of Navy Pier and request a drop-off at the Theater’s dedicated parking entrance at the RIVA turnaround (Entrance 1, about halfway down the Pier). Enter through the doors and turn right to reach the Theater. Rideshare pick-ups are available at the Theater’s dedicated parking entrance at the RIVA turnaround (Entrance 1). Rideshare users should tell their drivers to meet them at the Central Rideshare location for the RIVA Turnaround. To reach the turnaround, turn left (east) at the foot of the Theater stairs and proceed down the hall past Tiny Tavern. For more information on public transportation routes and schedules, visit the RTA website or call 312.836.7000. From fine dining to casual bars, restaurants and food court, Navy Pier offers a wide selection of options each and every time you visit the Theater.